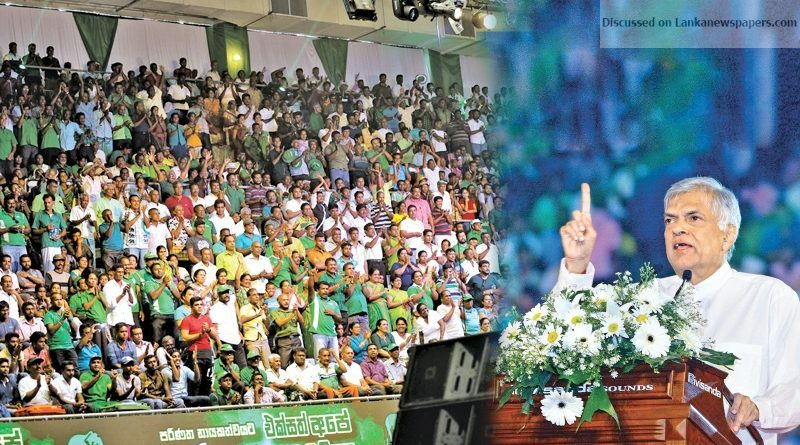 A UNP which will rule for the next 20-30 years and not just five, was the promise UNP Leader and Prime Minister Ranil Wickremesinghe made to his supporters as the party commemorated May Day at the Sugathadasa Indoor Stadium yesterday. Last week the UNP had taken over the Ministry of Social Empowerment and the Prime Minister who had promised quick action noted that they would bring in the Samurdhi Bank under the control of the Finance Ministry and Central Bank to avoid rampant corruption in the system. A Samurdhi that would be apolitical and operated under the District Secretariat was thus promised in future. “On the 70th anniversary of the Party, I promised to create new leadership within the party. I have done that,”said the leader to a jubilant crowd as he referred to the new appointments to the UNP leadership. J.R.created three leaders to take over after him, but, we lost all of them. I have the spare wheel, the third wheel in the three-wheeler,”the Premier said. “In 1994 when I took over, people said the party would die off after me. We had not only lost our leaders but many of you lost your family members over the years, killed because they worked for the party,” the Prime Minister said. Thus his vision of an unbroken UNP government he said could only be achieved by building the second tier of leadership, “More new officers would be appointed soon. I can’t take it forward forever,” he said. A complete restructuring of the party was promised in the party’s journey to achieve long term power. “All of you here now have to work as a team. If you can work as a team, the UNP can last for the next 20 years. The responsibility to bring victory to the party, I hand over to each one of you. I want to create a small Sirikotha in every village”. “I have laid the foundation now get ready to run,” stressed the UNP leader. The Prime Minister noted that since taking over power, the government had steered a difficult path to overcome the debt trap it had been put in by the previous regime. Whilst also winning over the international community, he said they had spent time encouraging investments, establishing the rule of the law and laying the necessary foundation for future growth. “The drought, floods and even the collapse of the garbage dump affected us. But we did not let the economy fail despite the setbacks, we can now repay all our loans in 2018-2019,” the Prime Minister added. However, admitting that they have failed to fulfil the aspirations of their supporters, the Prime Minister reiterated that the government would provide employment to graduates and train unskilled workers so that they can find employment in the private sector. “The Sri Lanka Podujana Peramuna (SLPP) is not a party.We have to see why we lost the last Local Government Elections. We have come through even worse defeats, in 2015 no one thought we would win”. “The UNP today is the only party which can provide the country with stability,” Prime Minister Wickremesinghe said.